Andrew's Blog: Interrogative remarks followed by statements that involve various forms of punctuation. This is some really fascinating stuff! The loose planning is particularly intriguing, because the Kernelsprite prototyping is something that fascinates me because of how much of the design it defines - the dressing in which the plot is clad, I guess you could say. Maybe I should actually sign up to the forum so I can start pushing for a Pumpkinsprite or some nonsense like that. This was fun and informative to read. If you ever want to do it again in the future, that'd be pretty great too! I really appreciate getting insight into the design and production process. Haha, still wondering if Dave's Bro is gay or not! This blog post was really interesting. Thanks for taking the time to write it. Also, if you want to be able to make retro sound effects really easily, I advise this one sound effects generator. It is done entirely in flash, and is simple enough for someone as artistically incompetent as me to use. Oh man, I totally hadn't made that connection with the grist - stuff in WV's bunker type thing. Really cool to see Mr. Hussie's input on this; I feel like I just watched a director's commentary for a movie, but you know, witout being bored to death. Thanks a lot for this. I hope we might have something similar again in a few acts, (but not too many). Still wondering if Dave's bro is gay though. 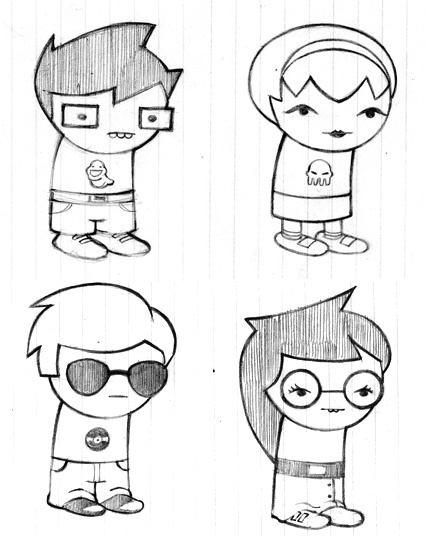 Wow, this was a really interesting read and provided an awesome behind-the-scenes look on what goes on in Homestuck. How you can work so hard on things like this, I have no idea but boy, I am glad you do. Keep up the good work man. Anonymous: "Oh man, I totally hadn't made that connection with the grist - stuff in WV's bunker type thing." Honestly I don't think anyone did. Well! Homestuck is probably the most exciting thing I've seen happen online in a while. MSPAs are kind of an unique medium, and it's great to see that the author is so in tune with what he creates and the community around him. Well, the thing with Mother 3 is that a great deal of stuff for it was planned back on the N64 and modified. I can't really compare it to PS or Homestuck myself, because I see the MSPA stuff as being a different medium and format. "Haha, still wondering if Dave's Bro is gay or not!" Ok I will endeavor to answer this question in a SERIOUS MANNER. I think a question like this shouldn't even have a real answer, particularly with respect to the highly stylized "faceless guardians" of the children. Much of their reality is implied to be filtered through the perception of the kids, and so is open to plenty of reader interpretation. Their portrayal is stylistically robotic by design, and so there is only so much depth that can be assigned to them, and even then you are limited to the sketchy evidence supplied. What we know about Dave's Bro is he is (or Dave believes he is) a master of hyper-irony. You either take this at face value, or you question it. Personally, I always took those elements at face value. That Dave really IS that cool, and bro really IS that ironic, and so on. But this is a case where the POV of the author doesn't really matter. Because the author is also explicitly stating it is open to interpretation. He is getting idea's from the forum...you people do realize that the chances of WV being an imp are very, very high. What have we DONE! Unfortunately, it wasn't released outside of Japan, but you can download a ROM, and there's a language package that some fans made to translate the game into English. It is, quite possibly, the best RPG (possibly even best game in general) ever made for the GBA. Aside from the Goldensun series of course. "hey, you looking for something to eat?" "No, I ate before I came home." "alright, well there's [random leftovers] in the fridge, [random snack] in the pantry, and we've got [random candy] in the cupboard. help yourself." Thought you'd like to know that Dave's style of chat is really influencing mine. I have grown some sort of bizarre fascination with your work, AH. I overanalyze every Homestuck update. I read every update in the news section at least three times. I humbly request that you never stop creating things ever, because I really can't afford to start stalking you. By far the best response I've ever heard for "what's your favorite color"
Also, thanks for taking the time to do the Q&A, it was a very enlightening read. I'd say keep up the good work if I didn't think you were incapable of producing bad work. Instead, I tip my hat to you. And then I read this. Learning about your creating method - specifically, that you treat it more or less like growing a bonsai - has been eye-opening, and I'll definitely be using it next year. Thanks! I really like the sfx and hope you can at least find some intermittent uses for them. Thanks for posting this, I shriek with joy when I see new pages up. Is it weird that I felt flutters of panic and anxiety when it was said it's possible there may not be a next adventure???? Hooray, my insatiable hunger for the content you so rapidly produce is assuaged, for a time! Possibly even better than a comic update, since it takes me longer to digest several blocks of written text than a short sequence of images. This is why the forum adventures section of the MSPA Forums has really taken off. I feel kinda responsible for getting it off the ground, since I was part of the epic roleplay that happened in the suggestion box during problem sleuth's epilogue, and also because I was one of the first to make an MSPA-style adventure on the MSPA forums. Some of the MSPaintAdventures Forum Adventures (or MSPAFA as they're now known) are clearly derivative of problem sleuth and homestuck, some just reference them, and some (like mine) are completely different in all ways except the medium in which they're told and the use of reader suggestions to shape the plot. The MSPAFA community, its wiki, and my own comic (!) have all been linked to by AH himself at some point, so I feel justified in saying I have some knowledge of Forum History in this way. On the other hand, I have not yet read some of the true epic MSPAFAs, like Mutewood and Crystal Raver, and some of the MSPAFAs I did read ended up hitting points where their artists simply could not continue, like Overtime and Blobby. So the benefits to signing up for the forums are twofold, at least: You get a little share of input on the story (partly through suggestions but mostly through speculation), and you also get easy access and participation in the MASSIVE RANGE OF FAN-GENERATED CONTENT for those rainy days when AH is busy working on a Strife or a Countdown. And let's not forget about the chat! You can get to it quickly using pesterchum.blogspot.com, or you can sign in via your favorite IRC client to #pesterchum@irc.esper.net. There's so many adventures now (and adventures ABOUT adventures) that I've actually started a project to index the damn things! I think you will find that MSPA-style goodness can be found in abundant quantities now that a sufficient number of people have jumped on the bandwagon. wait, I have a super important question! do you have a day job, or is this your day job? if the answer is the former: how the hell do you have time to do all this + your star trek edits + have friends? if the answer is the latter: how do you manage to make enough money off of this? AN EVEN MORE IMPORTANT QUESTION HAS CROPPED UP! which one is sweet bro, and which one is hella jeff?? The simple fix to the whole user contribution situation is then to put in more elements like Serenity. That is, little random tidbits that aren't meant to have any impact in the story. Then anything can be done with these things and it won't matter in the end, or it may, in fact, become something important by chance. Great Q&A! It answered a lot of questions I'd had recently about the users seeming to have less impact on the story. With the community having grown so much from when I started reading (early Problem Sleuth) it's almost a certainty that someone will effectively say "--> do what the author wants" with regards to the plot. The most effective place for user input is in the game mechanics. When the forts and imaginary worlds came into Problem Sleuth was when the story started rolling as surely as sweet bro down those stairs from three detectives looking for a key to confection-clad adventurers battling a demonic demi-god aboard a flying ship with a side of particle and astrophysics. As a side note, on multiple occasions I have managed to fall up a flight of stairs (tripping near the top, somehow rolling up 2 or 3, and coming to a stop at the top). I don't know what to make of it, but IT KEEPS HAPPENING. If only someone had warned me. "What I'm thinking now is, 04/13/10 will still be a key date. The story will build to something critical on that date. But then it will keep going for a while longer, to allow it to wrap up more naturally. Whether this is for another year, or less, I can't say. But I'd rather it not be more." Dave's hair, Blonde, or white? I know it is white in the comic, but Dave seems rather young to have white hair, So i assumed it was blonde, Yet my friend still thinks it is white. Im confused. I want to laugh at this, but I'm afraid that might be considered making fun of a dead stick with a poking horse. All well. Haha.